Komodo Habitat Dial Humidity Gauges are designed to help you quickly and easily measure and monitor the humidity in your reptiles home. Humidity is important for keeping your reptile or amphibian healthy and most shedding problems with reptiles are linked to incorrect humidity levels. 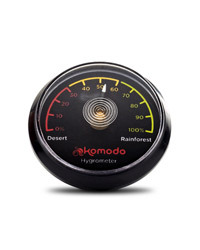 Using a Komodo hygrometer will help you maintain a healthy humidity level for your pet with its large easy to read display. The Komodo dial hygrometers easily install inside your vivarium or terrarium (analogue hygrometers like this one need to be placed inside where you want to measure the humidity) they will still work in humid environments due to their fog resistant seal. No batteries or external power is required, simply stick in the enclosure with the sticky back pad included.